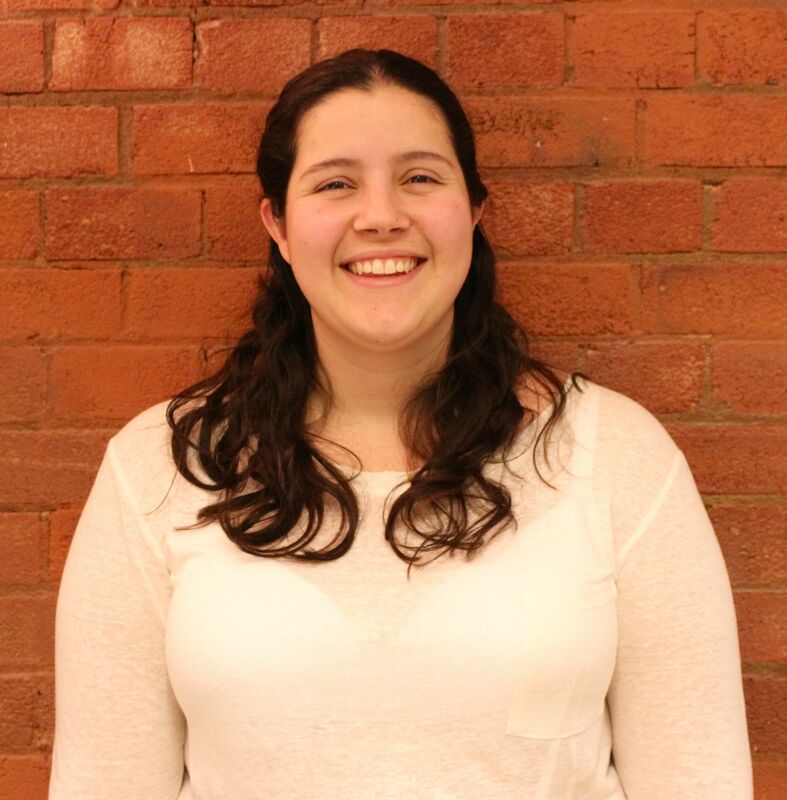 Today’s blog is from Mariana Podmore, Sales Assistant to the Foreign Rights team at our sister company Red Lemon Press. As well as loving books of all shapes and forms, Mariana loves knitting and today she blogs for us about her favourite knitting supplies shop: Loop. You can find her tweeting at @marisantanapod. I started knitting and crocheting when I was about 19, but when I moved to London about 3 and a half years ago my knitting ended up being put to one side – I had no needles or yarn, and knew nowhere to get them! When I finally just had to get back to it, it was Google who pointed me in the direction of what quickly became my favourite local shop: Loop. 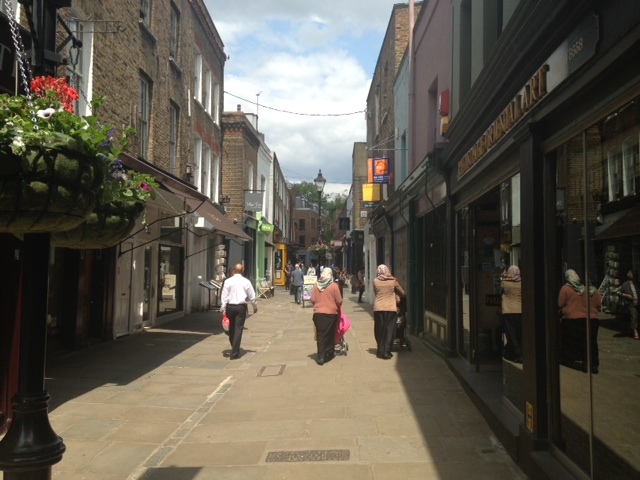 Loop is located in Camden Passage, a lovely pedestrian street filled with quirky cafés, furniture shops and well known for its antique shops and market. 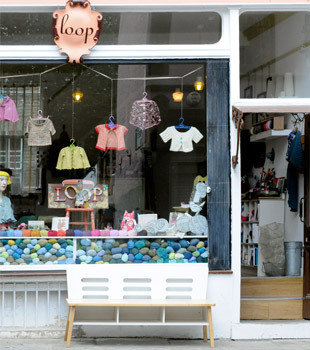 Location is definitely part of the shop’s success: Loop is surrounded by other similar shops – one of a kind, independent, cosy and designy-looking. 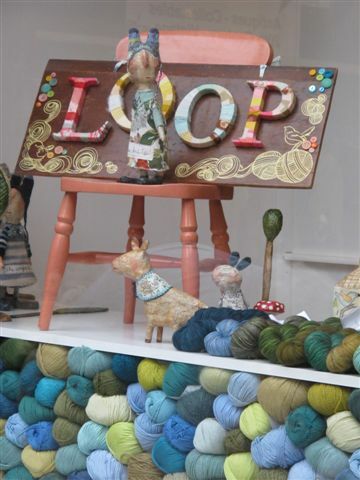 Loop mainly sell very special yarns: imported, hand dyed or with something extra, as well as beautiful needles, buttons and even scissors. For many of their suppliers they are exclusive UK retailers. As well as great product and location (ok, those are VERY important) the other thing I think that Loop does so well is creating a communal environment: knitting is a communal activity, it’s the kind of knowledge that is usually passed on from person to person, and done along with friends, who help and encourage each other. And of course you can only knit so much for yourself – inevitably everyone you know will be getting a knitted gift! Q: Can you tell me a little bit about how the shop started? 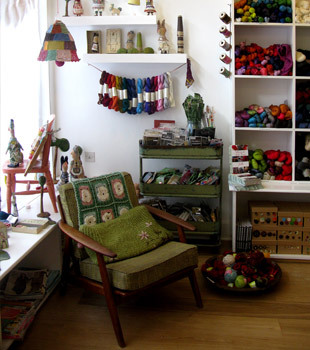 A: I opened Loop in 2005 as I was passionate about knitting and textiles and I could not find any shop in London that reflected what was going on in the knitting community. 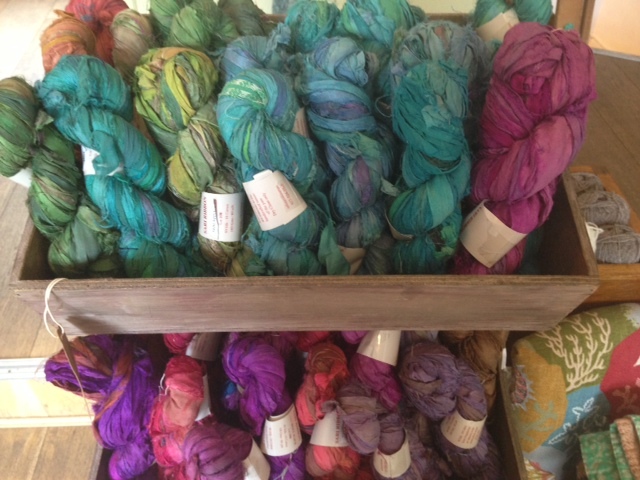 There has been a huge explosion of gorgeous hand-dyed yarns, natural fibres and beautiful patterns and I just wanted a place that people could go to to see these things as well as offer a great variety of knitting classes and things made by independent designers working in fibre. Q: I know I love the shop, but what do you think makes Loop special? A: I think the passion that I have for colour and texture and all things to do with knitting comes across when you walk in the shop. I never stop trying to find more beautiful and useful things for the shop. We also have terrific dedicated staff who are excellent knitters and crocheters as well as being lovely. Q: What are some of your strategies to make the shop visible to the world and to keep customers coming back? A: Well, we have a beautiful website and blog. We send out a newsletter every week and that lets people know about what is new in the shop, events coming up and other interesting bits. We also often have a free pattern on the blog that people can download. We have a huge following on Facebook and Twitter too and a group on Ravelry. All of these things keep our customers aware of what’s going on in the shop whether they are in London or Tokyo. Q: Do you and other local shops organise together to keep the area relevant and encourage more customers to come by? A: A little bit. Camden Passage organises some events a couple of times a year, but it is a very active area anyway with loads of interesting shops, the antique markets and cafes. Q: You sell your products online as well, how has online shopping affected your business – did you feel a big increase in business, or is it more about making the shop visible to people in the online world, who will then come and visit you? A: Both really. Our online shop is very important to us so we can offer yarn and books to people that are often hard to find in other places. Just a bit north of the Angel tube stop on Liverpool road lives an amazing little delicatessen/cafe/food shop that makes my heart sing (and my stomach rejoice) every time I visit. It’s one of those places that makes you proud to live in the neighborhood. Everything they make or stock is hand-picked and absolutely delicious. And it’s not crazy foams or some air-spun wasabi that makes it so — it’s all about good, local ingredients. If you haven’t been to Pistachio and Pickle for their weekend brunch special or their newly-added afternoon tea, it’s time to change your plans this weekend and head over there. No matter what you order, you’ll be delighted, from the most beautiful simple plate of scrambled eggs and smoked salmon to the adventurous brunch specials. On top of that, the owners, Steve and Matt, are two of the nicest, friendliest people around. 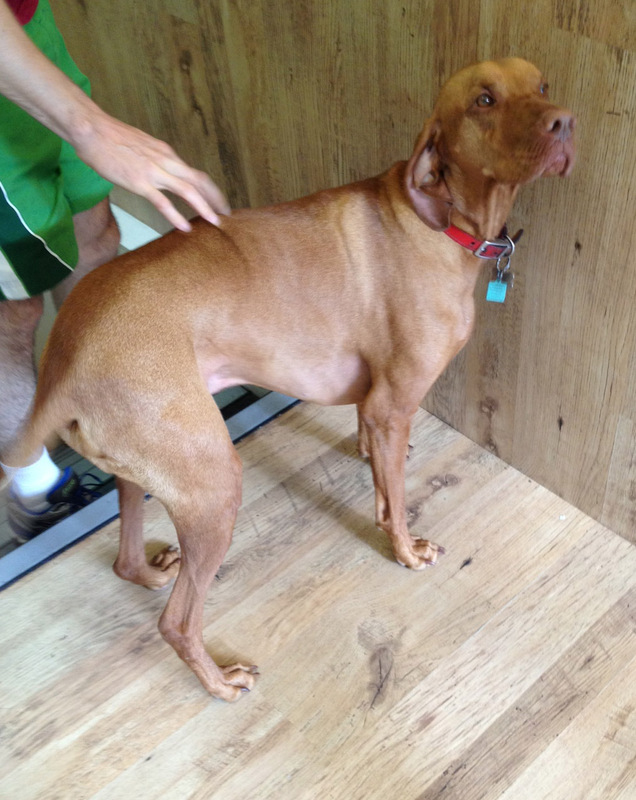 Plus, if you get in at the right time, you will get a personalised puppy greeting from their sweet dog Cooper. Cooper, the official Pistachio and Pickle morning welcoming committee. It’s also just a brilliant example of a local business done completely right. So I asked Matt and Steve to answer a few questions about P&P, and what they think can be done to reinvigorate local business on the high street. Q: What made you decide to open Pistachio and Pickle? A: We’re huge foodies, and have spent years cooking for our friends and families. So we decided to set up the the supper club and then from there we took the plunge and gave Pistachio & Pickle a permanent home. Q: How did you decide on the location? The location found us! 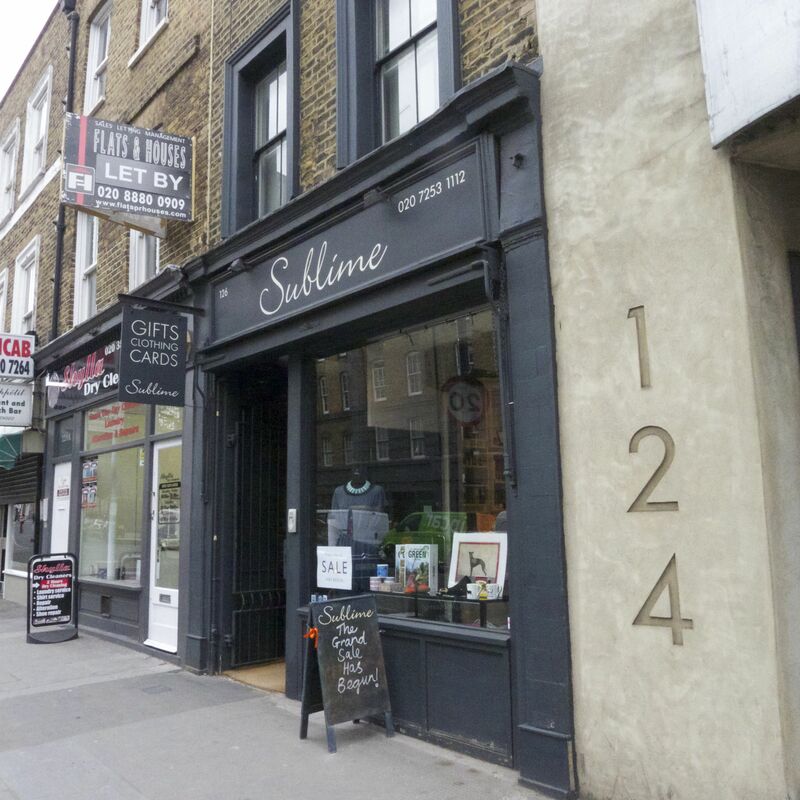 We were looking for premises and as soon as the property details came through we knew Barnsbury was the place to be. It has a great sense of community and we wanted to be be part of it. A: We thought long and hard about the name, we originally set up as a supper club and our favourite course was the cheese course – and we always made our own chutneys and pickles. This got us thinking about calling ourselves something & Pickle….we eventually came up with the exotic and rather expensive Pistachio & Pickle. Q: You guys seem to know everyone who comes in the shop, and everyone seems so at home in there. How did you make that happen? A: Over the past two years, we have spent nearly every working minute serving our customers, listening to what foods they like and getting to know them all. 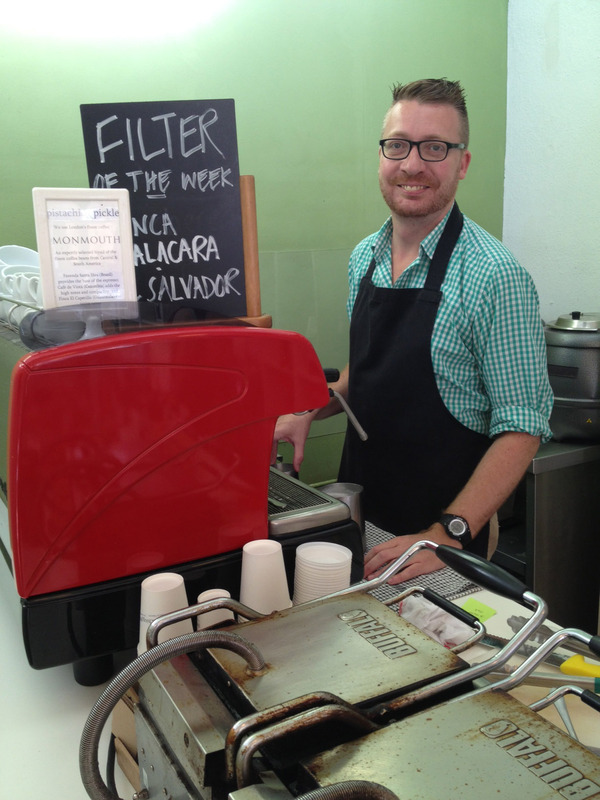 Most of our customers are regulars and we know their coffee and their name. A bit of cheese perhaps? Q: You seem to source your ingredients from a lot of local, family-run businesses around town. What motivates you guys to choose local products? A: We make sure our products have a sustainable origin and we are able to tell our customers about it – they set us apart from our competitors. I’ll take one of everything, thank you. Q: There’s a big concern right now around the loss of local shops on the high street. As a successful local business, what do you think can be done to solve this issue? 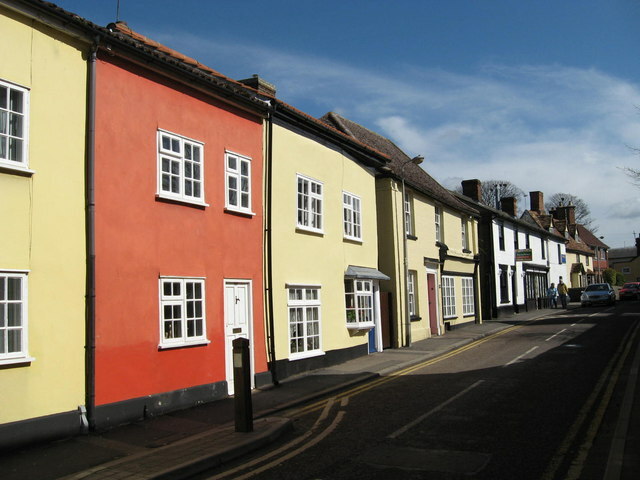 A: High streets are the centre of a community, and they can brings jobs and vibrancy to the area which benefit everyone. High street rents can be extremely high however, and there should be more support for small businesses to set up. Customers also need to be motivated to shop in independents, so we see it as our job to provide the hand-sell experience which differentiates us from other retailers. Q: What is your favourite item on the breakfast menu? Steve’s favourite brunch is our current special – pork and apple eggs benedict with salbitxada. Matt enjoys the brioche French toast and yoghurt with fresh fruit pot. 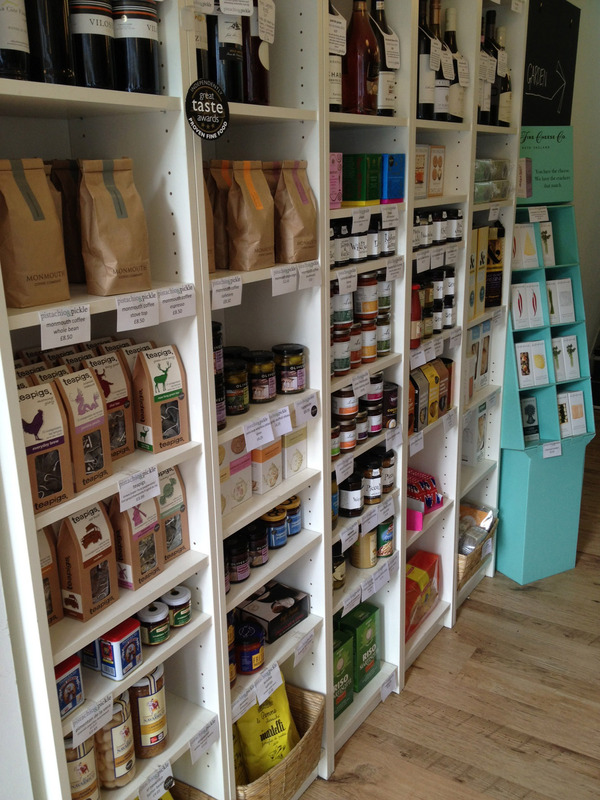 Yummy and carefully selected stock of Monmouth Coffee, Tea Pigs tea, The Relish Company jams, and lots of other goodies! Q: What products are you most excited about right now that people have to try? A: We’re most excited by our new British farmed charcuterie. 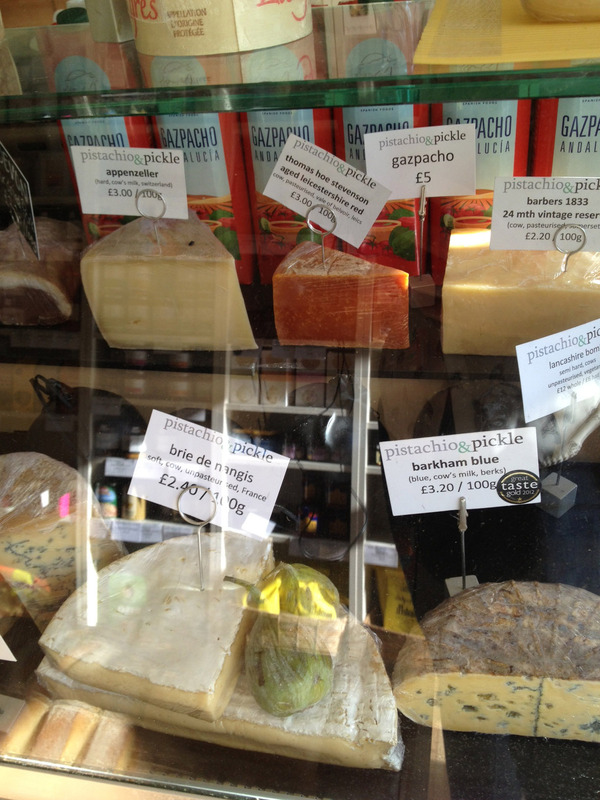 We’re now selling air-dried ham in the style of parma ham but from Worcestshire, bresaola style beef from Dorset and salami from Kent. A: Our cheese toastie is our signature sarnie and is our biggest seller – the real secret is using good mature cheese, spring onions and a secret ingredient, which I can’t tell you about or I’d have to kill you! 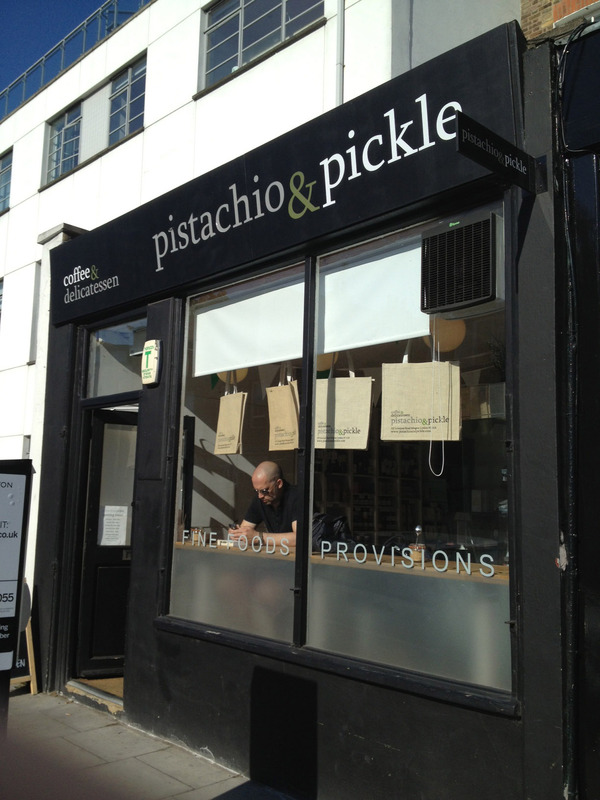 Don’t forget to follow Pistachio and Pickle on Twitter, and tweet us your pics when you visit P&P! Love Your Local: Look Mum No Hands! If there is one shop that covers our local needs (beyond those already taken care of at Sublime), it’s the brilliant Look Mum No Hands. It’s a workshop! It’s a cafe! It’s a bar! It’s a gift shop! It’s a place to borrow an adjustable wrench/ bike pump from in times of need! 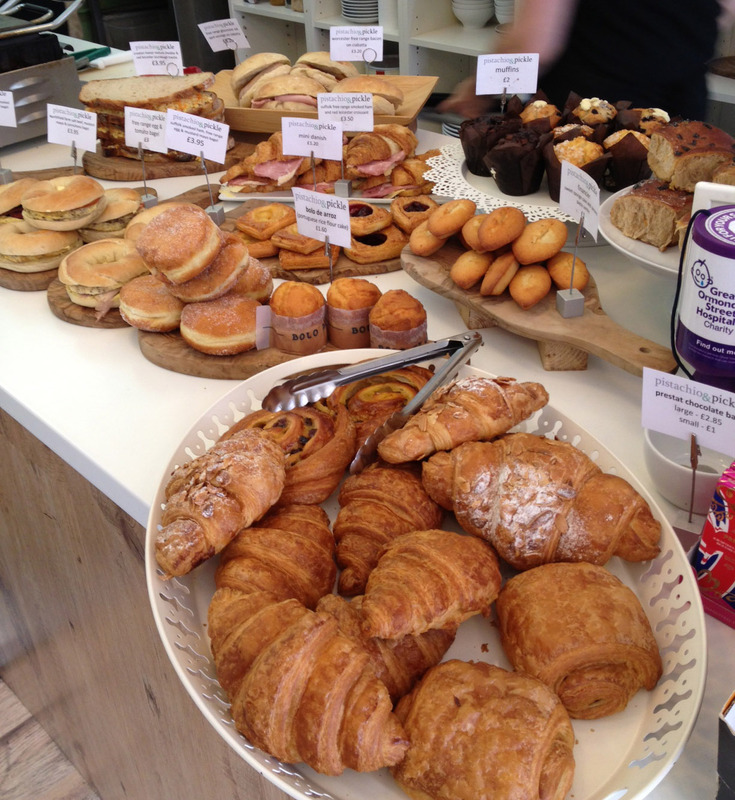 AND they sell really tasty cakes, which is great because there’s a real shortage of cake here in the office. 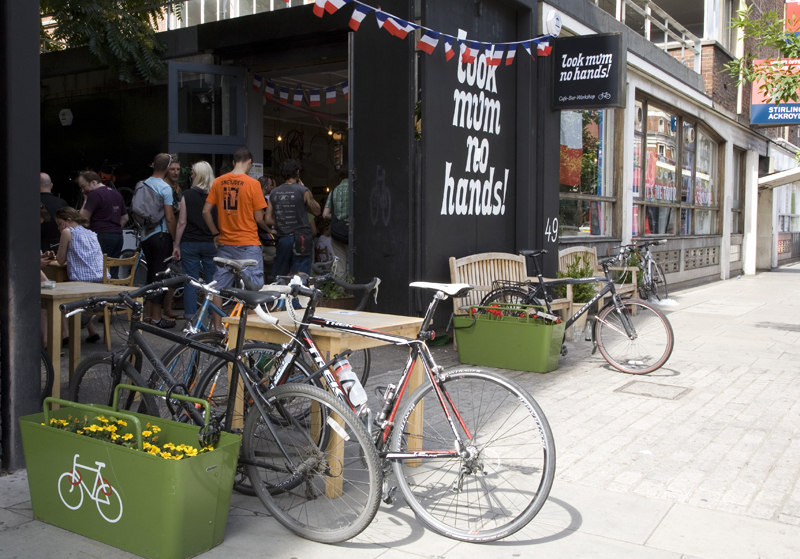 Located just around the corner from HKB HQ on Old St, we’ve almost equalled numbers of bikes fixed to lunches eaten in this buzzing shop. There’s space to sit outside (a rare treat in EC1), delicious pies, great beer and friendly staff. And in an office of keen and occasionally accident prone cyclists, what could be better! 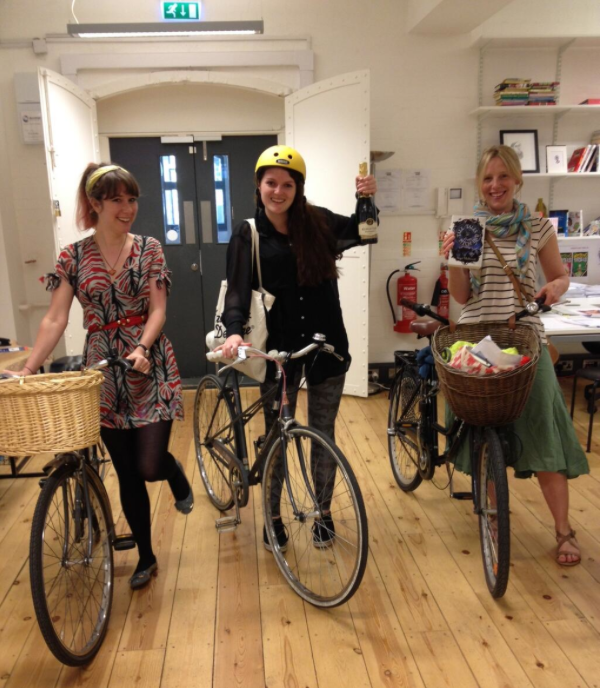 (If you’d like to join the HKB/RLP bike gang, please apply to @HotKeyBooks. Suggestions for a snappier name welcome, bottles of prosecco not necessary). They also run some brilliant events, exhibitions and classes – including a bike maintenance workshop for the totally clueless (hello!). Find out more here. So grab a book and head here for breakfast, lunch or dinner – you don’t have to cycle there, but you know, it helps. Moving to Clerkenwell after nearly fourteen years of working in the heart of Soho was a bit of a cultural leap for me. I was nervous. What would I do at lunchtime? How would I manage without Liberty and indeed Fenwicks to wander around for a bit of retail entertainment? Where was the nearest Boots? Clerkenwell is probably the epicentre of epicurean London, but it is not the retail heart of the city. I soon discovered that actually I didn’t need the distraction of shops as much as I thought I did, and instead I have enjoyed exploring the neighbourhood’s ancient churches, museums and parks which are surprisingly abundant. But we all know that on occasion you just have to go to a shop. 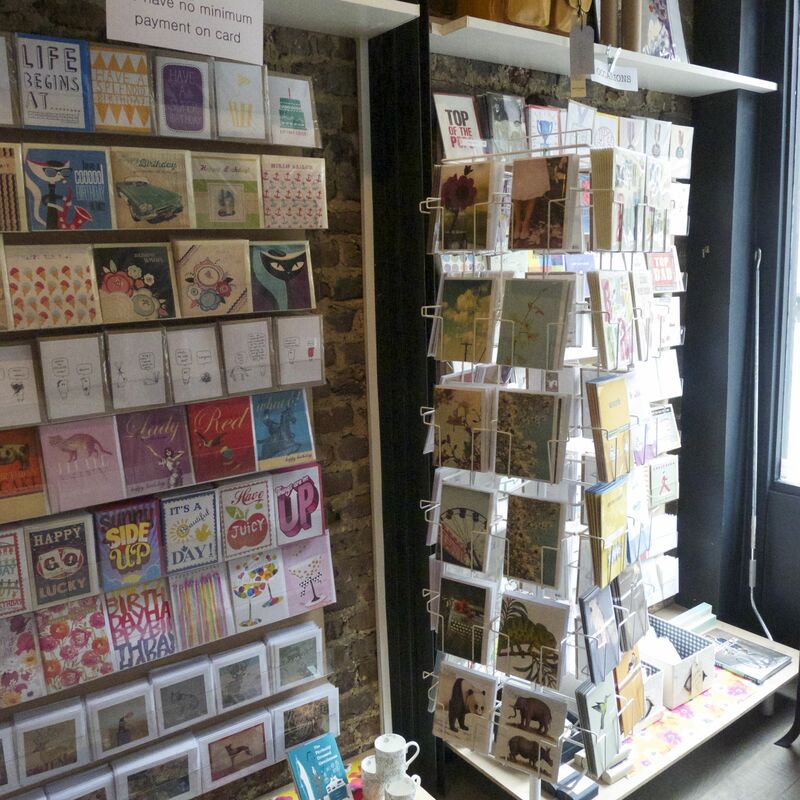 You always need to buy that last-minute birthday present, a new baby gift, a card or an author present, and here in our little corner of Clerkenwell we have the suitably named Sublime. 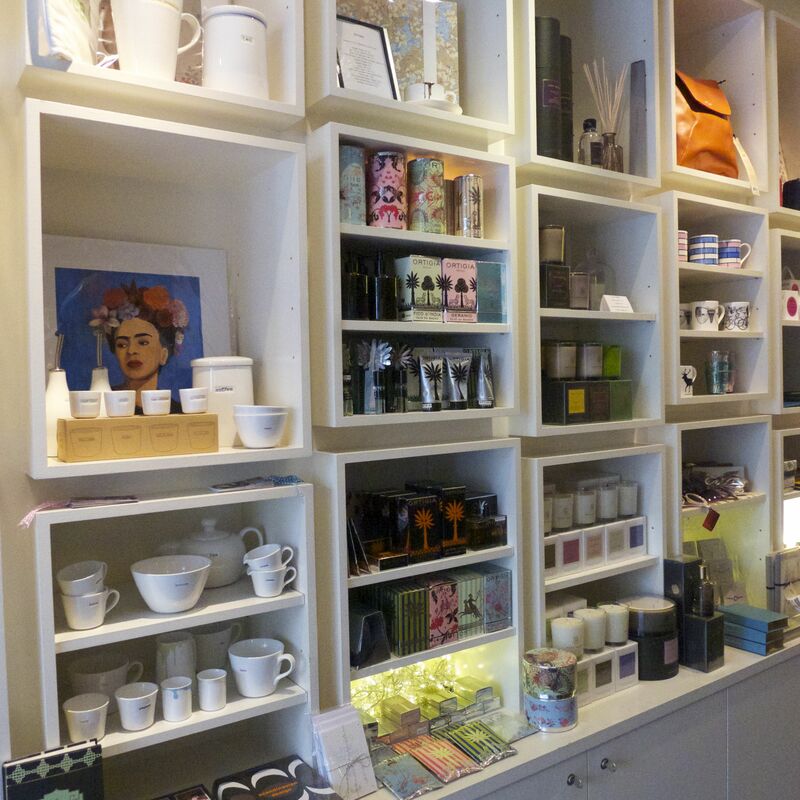 Sublime is a wonderful shop with just enough of a little bit of everything to offer and a range of choices on most things from scented candles to Frye boots, greetings cards to earrings. 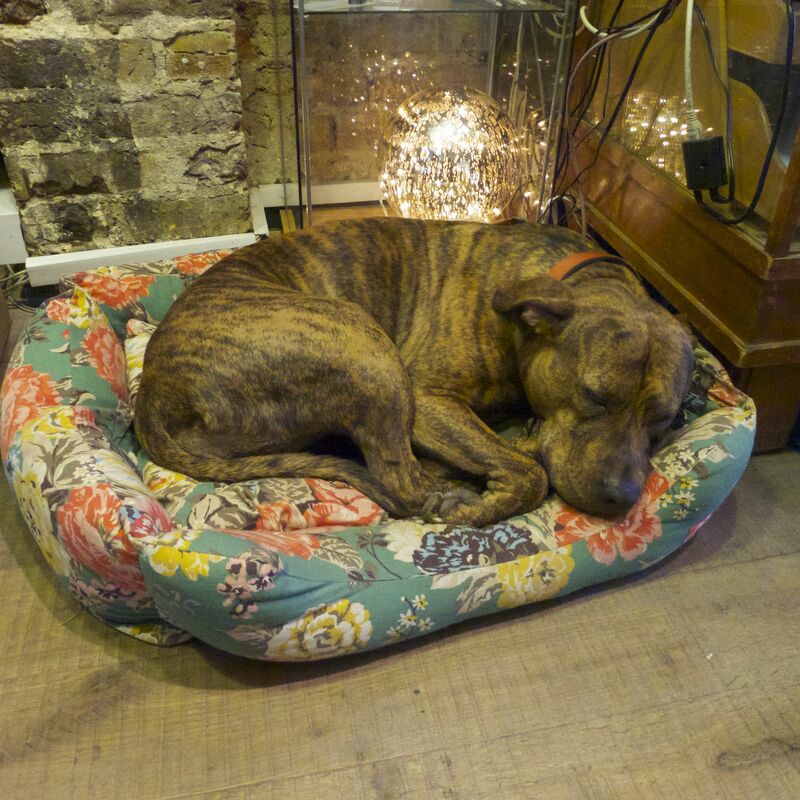 Sublime is perfect — they even have a wonderfully named dog, Bliss, who can be found pottering around keeping an eye on you as you peruse the stock. Bliss, sleeping on the job. 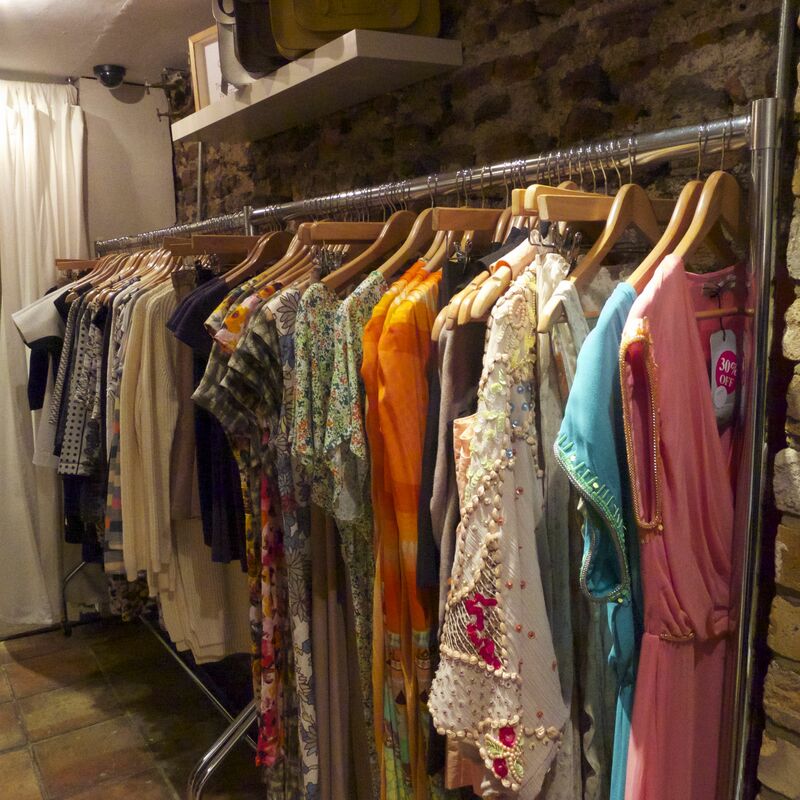 Arranged over two floors, everything on sale is lovingly and carefully hand picked and reflects the tastes of the managers in its delightful boho chic sensibility. 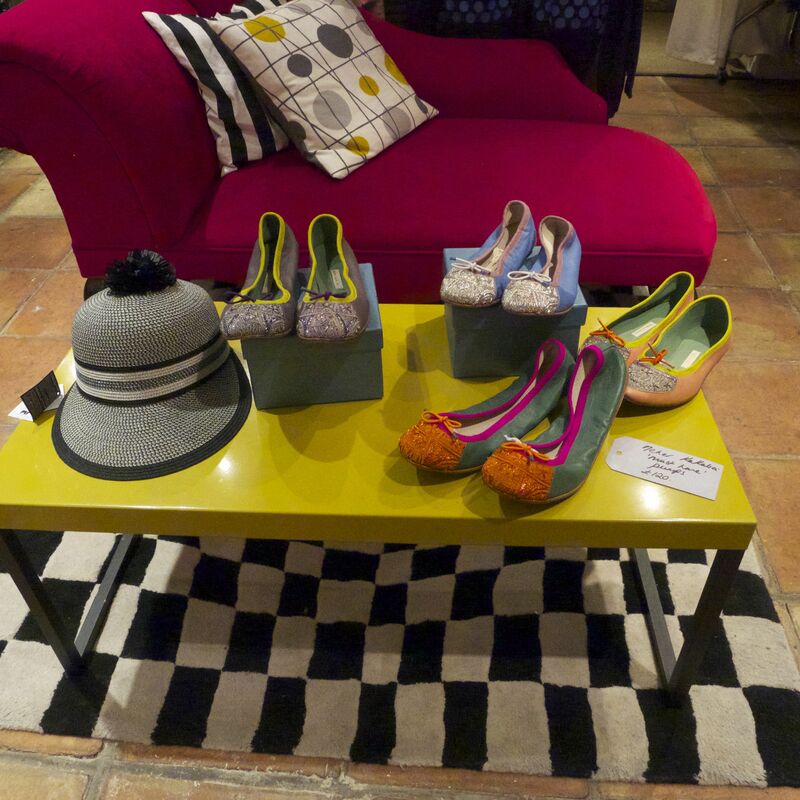 There is a wonderful range of clothes for women and a delightfully varied selection of gifts. All our publication day cards that we send to authors come from Sublime, as do most of the office birthday presents we buy. I can also now confidently assert that anything new that I wear, from a shirt to the aforementioned boots, is picked straight from the Sublime stock. No more department stores for me. I am a dedicated fan of the small and local, and Sublime answers all my retail needs. Almost. It is still a long walk to nearest chemist. Sublime is hard at work right now on their web site and social media streams. Soon, you’ll be able to shop online on their brand-new web site! For now, bookmark their site, and follow them on Twitter. Have you been to Sublime? Or do you have a local Sublime-type shop you just can’t live without? Let us know below or give that amazing store a shout-out on twitter using #loveyourlocal! Want to know what teenagers want? Ask them! 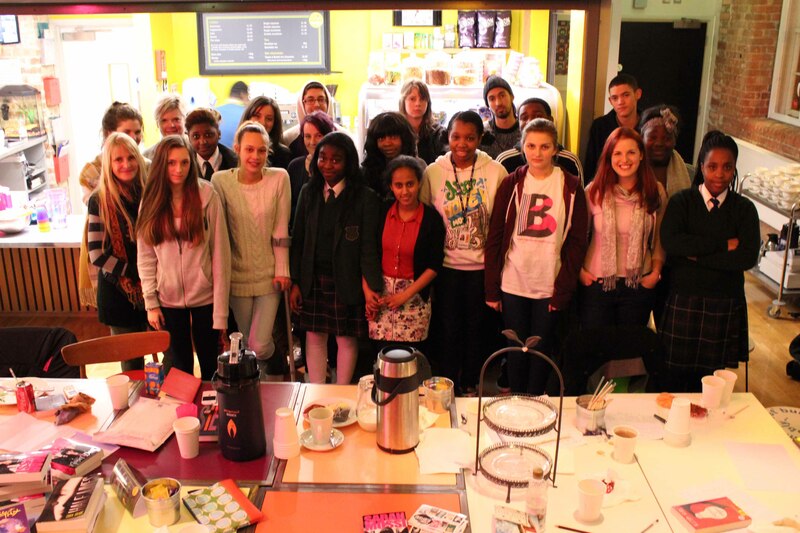 This year, we have been working closely with the fantastic Platform youth hub in Islington to build a series of author-led creative writing classes for young people aged 13 to 19 called Write Ideas, which runs every Tuesday evening in term time. As part of Word 2013, Islington’s month-long celebration of reading and writing, authors Sarah Mussi and Sara Grant have put together an event to showcase the young people’s writing from Write Ideas, and to chat about the books they enjoy reading and draw inspiration from for their own writing.